Guerlain La Lacque Couleur #700 Blue Ocean is a gorgeous turquoise green with hidden light green shimmer. Depending on the light and the background color, it shifts more blue or more green. On my fingers it appears to be more green than blue although in the bottle, I thought it is even greener. This beauty is unfortunately a little sheer. Depending on the condition of your nails, you might need two or three coats. My ring finger nail is a little bumpy so there I definitely need three but I can get along with two on the other fingers if I apply generous coats, Below I applied three to each finger. The hidden shimmer is gorgeous. Almost Chanel Jade gorgeous, but not all the way up there. Since the shimmer is a little cooler toned than the base, under the sun it looks bluer. Once the light hits on your nails, you can see the faintest of shimmer giving some dimension. I really love Blue Ocean. I am a huge aqua colors/turquoise fan for summer so this is right up my alley. I also always wanted Guerlain nail polishes breaking free of their lipsticks and have their own characters. Since the bottle changed, they kept on releasing reds and pinks, Sulfurous (reviewed here) being an exception. So I was jumping around with joy when I see the green/turquoise polish in this year's collection. By the way I have seen some reviews showing Sulfurous being dupes to Chanel Terrana (reviewed here). They are not remotely close, just saying. Of course me being crazy about aquas, one wonders how they all compare right? I pulled out a few shades from my stash and the results are very surprising. I don't have anything like Guerlain La Lacque Couleur #700 Blue Ocean! Chanel #407 Jade, Dior #504 Waterlily and Illamasqua Nomad are all more yellow based greens. Burberry #418 Aqua Green is deeper. 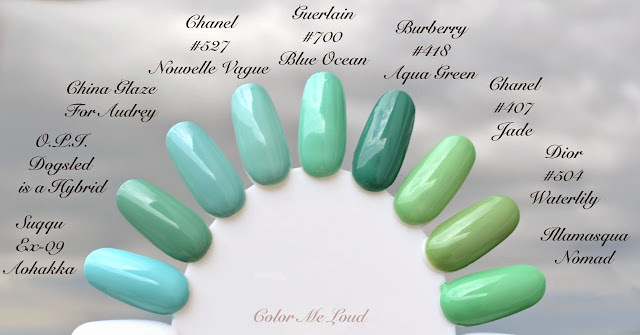 Chanel #527 Nouvelle Vague and its (almost) dupe China Glaze For Audrey as well as Suqqu Ex-09 Aohakka are more blue. The closest shade I have is O.P.I Dogsled is a Hybrid which is deeper and greener. 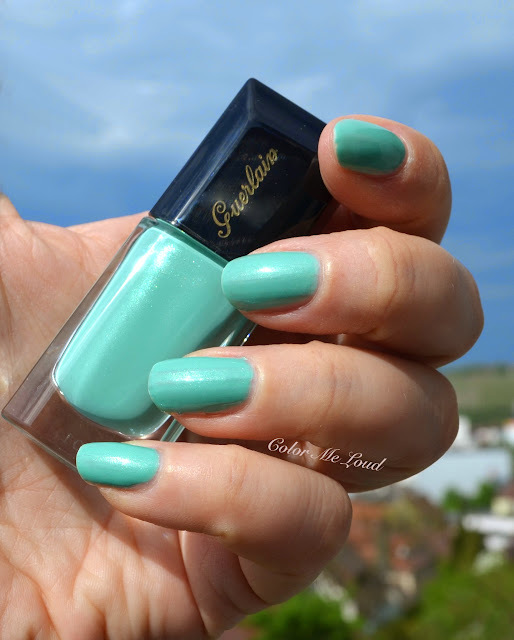 All in all I am wowed by the originality of Guerlain Blue Ocean's shade. It is a perfect balance between blue and green, dark and light, pastel and not. Can you tell I am loving it? Temptalia reviews Ocean Blue here, gives it a C. I personally don't agree to that. It is a little sheer but classics such as Chanel Jade and Nouvelle Vague are also a little sheer. It is definitely buildable and on me it applied smoothly without issues. I don't have the streakiness which was mentioned. Final thoughts: Guerlain La Lacque Couleur #700 Blue Ocean is a gorgeous turquoise green with a right balance of blue and green. It has a lovely hidden shimmer. Since it has natural undertones, I guess it will look nice on many skin tones. I am deeply in love with this one and I don't care having to apply three coats on some of my nails. Are you eyeing Blue Ocean? Do you like turquoise on your fingers for summer? i don't agree with her review either! Why must it be opaque. I think a sheer aqua sounds lovely and it would actually look much better on more skin tones rather than being jarring on some. This is such a beautiful colour, I can't wait to get it :D Thank you for the review! Ahh I most probably need this!!! I definitely don't have anything too similar in my stash, so I am mega tempted. Not so sure about the 3 coats needed aspect tho. My patience is SO limited. Oh wow! I actually really like this colour. When it comes to lighter milky shades, I tend to choose blue but this turquoise looks really good. Thanks for the comparison - it looks like the perfect balance between blue and green! I couldn't agree more! I was so disappointed when I read Temptalia's review, but when I saw the polish in person, I simply couldn't resist. I'm so glad I bought it because the color compliments my skin tone and is summery without being overly bright or garish. I apply two coats over Guerlain's Base Protectrice and have not had any problem with color pay off or streakiness. You summed it up so nicely Susan. It is different enough to own, that is for sure. And... I have three bottles of Nouvelle Vague, it is my all time favorite nail polish. It is really pretty and unique! I don't like if my nail line shows through but it is not the case here. If you apply the coats generously, it is even opaque in two coats. I love it and really can't understand the rating. I am sure you will love it too. I also like more blue than green but this one is very very nice. It looks like a green when it is on its own but not overpowering. Like a soft muted aqua green, very beautiful. even without that base, I really don't have streakiness. You said it so nicely, it is not overly bright and very summery. As a plus it is really unique and beautiful. I think it would look good on many different complexions too. Thanks for stopping by. Thanks so much for the great pics and picture comparing all the different shades! Great work! !